Over 220 participants attended one of five regional trainings held in December 2013 to strengthen the awareness and skills of Ethiopian officials in addressing money laundering and financing of terrorism issues. 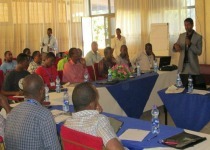 These two-day regional trainings were hosted by the Ethiopian Ministry of Justice (MoJ) and CGCC in Tigray region, Mekelle city; Amhara region, Bahir Dar city; Oromia region, Adama city; Debub region, Hawassa city; and Dire Dawa city. Participants included members of the regional Justice Offices, Police Offices, Commercial Bank of Ethiopia branches, Regional Revenue and Customs Offices, Supreme Courts, Higher Courts, and Regional Ethics and Anti-Corruption Commissions. Trainings included expert presentations and actively engaged participants in group discussions, and case analysis designed to raise awareness of AML/CFT issues and strengthen the implementation of the AML/CFT Proclamation. In most regions, these trainings received further publicity through TV and radio interviews conducted by the participants.